Pearsauce. It's the same as applesauce, except made from pears. Use it in the same manner as applesauce. A very simple recipe. Use ripe pears. As ripe as you would eat them out of hand. A little about pears first. They ripen after they have been picked. Tree ripened pears will ripen from the inside out and are too soft to can. Use store bought pears or pick them from the tree. If you tilt a green pear horizontal and it detaches from the tree, it is ready to be picked. Place the pears in a paper bag and in a fridge that is 40 degrees or lower approaching 35 degrees for 2 weeks. This will give the pears the chill requirement they need to ripen nicely. Store bought pears have already had the chill requirement and are ready to be ripened. Store pears in the paper bag with the top rolled down at room temperature for 5 to 7 days to allow them to ripen. Different variety pears ripen at different rates. Check the bag every couple of days for ripeness. Grasp a pear in the palm of your hand with the stem end up and your thumb at the neck of the pear. Press on the neck of the pear with your thumb to check for give. If the pear gives under pressure it is ready to be processed. Pears that are picked too green will not ripen but rot. We are going to use stem, skin and seed all. Wash the pears and quarter them, removing soft spots. Put about 1” water in a stock pot. Add pear quarters to the stock pot as you cut them. Cover and boil until pears are soft stirring to break them up. Process pears and juice through a food mill to remove the stem, skin and seeds. Measure pears into a clean stock pot and add 1 teaspoon cinnamon per 6 cups of pear sauce. Bring to a boil and simmer to desired consistency. If you use well ripened pears there will be no need to add any sugar. 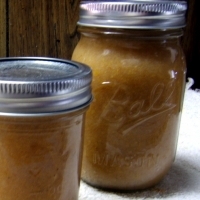 The pear sauce will taste a whole lot like applesauce and can be used interchangeably. Boil canning jars and hold them in hot water until ready to use. Bring two piece lids almost to a boil and hold them in hot water until ready to use. Simmer pear sauce down to your desired consistency. Six cups of pear sauce will make about 5 cups of canned product. Use pint or half-pint jars. Fill the canning jars leaving ¼” head space. Clean the rim of the canning jar with a dampened paper towel and screw the two piece lid down finger tight. Process jars in water bath for 20 minutes. Remove and cool, checking seal the next day.